This is not what my book looks like. Mine’s a Kindle copy. 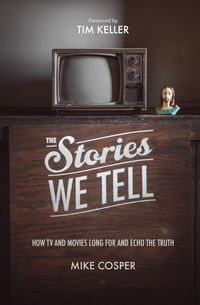 The Stories We Tell by Mike Cosper is a look at how human mythology reminds us of our need for grace and redemption. Unlike a great academic treatise, though, Cosper does spend gallons of ink on obscure myths or distant stories. Instead, he goes to the American Myth Machine: TV and Movies. These are our stories, after all, truly the places where America developed a culture different from anywhere else, and then began to export it. This is a book that sit on the fence about. First of all, I am highly grateful that this is not a “see how character B is like a Bible hero” book. There are more than enough of those. Perhaps too many. Neither is Cosper trying to find Bible stories or even sermon illustrations in modern myths. The Stories We Tell is more about seeing how our culture admits its need for the grand narrative that is God’s work in the world. Cosper writes with an easy style. I found the chapters slipping away nicely instead of laboriously. If this book had a personality, it would friendly. Mine, as a Kindle version, would be e-friendly, I guess. Overall, the point is well-made that we make movies and TV programs that show our desperate need for redemption. It’s a good friend in that way. My concern, and one that will likely have Cosper group me in the grumpy “Church Lady” category. First, I’m not sure that brushing all who have concerns about the actual moral content of entertainment aside as obnoxious prudes is appropriate. This book itself rides on the idea that stories inform and affect us, so raising moral questions about content is surely more than an exercise in Pharisaism and judgment. There is a hard line where glorifying ungodly behavior, and participating in it vicariously through media, should be classed as sin. Asking the question “Should we, as Christians, be entertained by seeing people treat God’s Word like dung?” does not “misunderstand what it means to be a Christian in the world” (ch. 1). It understands that the evil that pervades a fallen creation can creep in anywhere. That goes to the heart of my concern here. Many of the movies and shows recommended by Cosper go to some lengths in depicting violence and sexuality. I say “recommends” because he holds them up as examples that he has enjoyed. The position advocated in the book is that, if one is strong enough spiritually, then no harm comes from anything mentioned. Yet that does not seem to match reality. In all, I think The Stories We Tell is a worthwhile endeavor. I have some reservations about the recommended stories, but in all it’s a good work. Free e-version provided by the publisher in exchange for the review.